From Romanian pork rinds to Filipino banana sauce, you can get pretty much anything at one of New York’s classic international stores. This friendly Pan-Asian bodega is the place to go should your shopping list ever read something like this: frozen Thai durian, Filipino purple yam, Korean wakame, Indonesian tapioca crackers, and Taiwanese preserved duck eggs. 71 1/2 Mulberry St., nr. Bayard St.; 212-962-2020. Pound for pound, the best smoked-meat shop in New York. Get the garlic bacon (weekends only). Try some lamb prosciutto. And do not miss the Romanian pork rinds, a.k.a. jumari, a.k.a. chicharrón, a.k.a. meat candy. 43-09 Broadway, Astoria; 718-278-8847. Stock up on passion-fruit pulp, six-packs of Guaraná Antarctica soda, and every variety of bean known to man (or at least Goya). 32-15 36th Ave., Astoria; 718-706-7272. This supercolossal branch of the California chain peddles practically every Pan-Asian pantry item you can imagine and then some. Produce, too, is particularly impressive. There’s exotica like fresh durian and dragon fruit, purple yams and fresh peanuts in the shell, and giant Chinese okra. If you’re in the market for bok choy, you have a choice of five varieties. 157 Hester St., at Elizabeth St.; 212-966-4943. This bustling Latin American-style butcher’s display case is brimming with steaks, chops, hams, and sausages. And there’s enough offal to feed a thousand Fergus Hendersons. 45-52 46th St., Woodside; 718-937-0553. 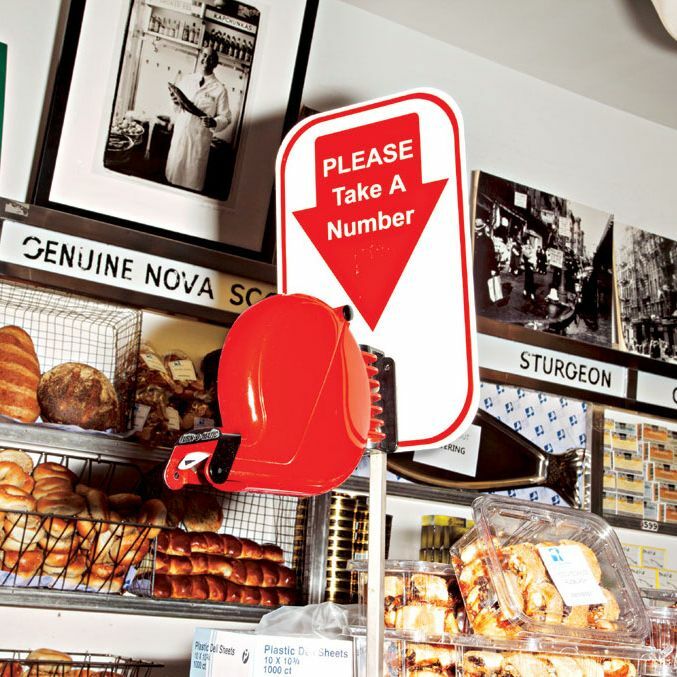 New York’s quintessential shop is not only the heart of Jewish-appetizing tradition but its gurgling stomach. 179 E. Houston St., nr. Orchard St.; 212-475-4880. Team Boulud bakes the baguettes and makes the charcuterie; Gallic groceries include Hervé Mons-aged cheese, Burgundy snails, and candied clementines from Corsica. 1900 Broadway, at 64th St.; 212-595-9606. This is the last of Yorkville’s once-ubiquitous schinken shops, or pork stores, and where some of New York’s most discriminating chefs buy their wursts and wieners. 1654 Second Ave., at 86th St.; 212-879-3047. The greatest hits of the British pantry, from Marmite to Branston pickle. The real draw, though, is the stock of housemade savory pies, bangers, and sausage rolls whose recipes come from founder Peter Myers’s family butcher shop in Keswick, England. 634 Hudson St., nr. Horatio St.; 212-691-4194. Sharp, sweet, sheepy—feta-shists have their pick. There’s also an olive bar, pitas of every persuasion, freezers of phyllo, and ultrathick Greek yogurt made in … Canada. 25-56 31st St., Astoria; 718-626-7771. No-frills one-stop shop for all your grain, pulse, spice, paste, and pickle needs—not to mention stainless-steel tiffins, frozen-curry dinners, and seasonal mangos by the case. 37-27 74th St., Jackson Heights; 718-898-3445. Sunnyside’s Irish expats come here for more than meat: There are teas and chocolates, breads and biscuits, and, beneath the sweets and potato-chip racks, the most impressive collection of Irish newspapers you’ve ever seen—from the Kilkenny People to the Limerick Leader. 43-46 41st St., Sunnyside; 718-784-1078. For everything the well-dressed falafel or shawarma requires, including first-rate tahini, za’atar, and amba. Plus peanut-butter-flavored Bamba, the Cheez Doodle of the actual Holy Land. 122 St. Marks Pl., nr. Ave. A; 212-477-4440. Tony May’s brother runs the warehouse-style show at BuonItalia (75 Ninth Ave., at 15th St.; 212-633-9090), while neighborhood nonnas take a number at landmark latteria Di Palo’s (200 Grand St., at Mott St.; 212-226-1033). Distinguished as much by the breadth of seeds, herbs, and spices the owner imports directly as by the carnitas and mole poblano she makes with them and serves next door. 800 E. 149th St., nr. Tinton Ave., Mott Haven; 718-292-7949. An Atlantic Avenue landmark since 1948, with destination-worthy hummus, baba ghannouj, and bulk nuts and grains. (Note: Olives are not self-service.) 187 Atlantic Ave., nr. Clinton St., Brooklyn Heights; 718-624-4550. Everything a homesick Filipino could ask for in a corner grocery, from Jufan banana sauce (the Heinz ketchup of the Philippines) in the condiment aisle to jackfruit ice cream in the deep-freezer. 70-02 Roosevelt Ave., Woodside; 718-899-1797. The ham, the bacon, and the smoked pork loin are terrific, but you go here for the 13 varieties of kielbasa, from biala (fresh) to swojska (double-smoked). 608 Fifth Ave., nr. 17th St., South Slope; 718-768-9676. The best and biggest assortment of rye bread in town. Particularly noteworthy: the extra-dark, super-dense, five-pound Anniversary loaf sold elsewhere in chiseled-down hunks under the Black Rooster label. 2201 Neptune Ave., at W. 22nd St., Coney Island; 718-946-2246. From pioneering Lower East Side restaurateur Annika Sundvik, an Essex Street Market shrine to the arts of foraging, pickling, preserving, and curing. Plus rye crispbreads, tube foods, salmon pasties, and licorice. 120 Essex St., at Delancey St.; 646-450-4544. Groundnut (peanut) stew is big in Senegal and throughout West Africa, and you’ll find everything peanutty at this snug Harlem shop, including butters, oils, sauces, and fresh ground and pounded peanuts. Also on offer: reddish-orange palm oil for cooking, rice, teas, condiments, and Senegalese couscous made from millet instead of wheat. 243 W. 116th St., nr. Frederick Douglass Blvd. ; 212-933-0374. It’s often said that except for Sri Lanka, more Sri Lankans live on Staten Island than anywhere else in the world, and this is where they go for rice and dal and spices as well as hard-to-find produce like fresh jackfruit and banana blossoms. 344 Victory Blvd., nr. Cebra Ave., Staten Island; 718-390-0052. McDonald Romain imports what he claims to be the best, healthiest produce from his native Grenada and neighboring islands and is generous with samples of boiled breadnuts, ripe sugar apple, and roasted breadfruit. There’s also a crackerjack kitchen at work in the back of the store serving comfort-food dishes like bake and saltfish and Grenada’s national dish, the meat-and-breadfruit stew called oil down, on weekends. 1127 Nostrand Ave., at Midwood St., Prospect-Lefferts Gardens; 718-221-0395. Ostensibly dedicated to Middle Eastern and Indian spices and sundries, this 70-year-old treasure chest is every New York chef’s secret weapon, a source of inspiration and a reassuring voice on the phone, eternally answering, “Yes, we have that.” 123 Lexington Ave., nr. 28th St.; 212-685-3451.